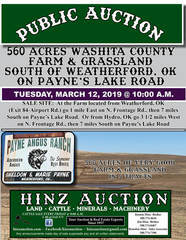 TUESDAY, MARCH 12, 2019 @ 10:00 A.M.
South on Payne’s Lake Road. The tract is in very good Cropland. The tract has mostly very good fences, a good well of water and a metal barn w/livestock lean-to. There is 147 ac. Cropland with the balance bing Bermuda Grass Pasture & Yard. 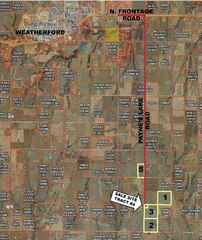 The SW/4 of 13-11N-14, W.I.M., Washita County, OK. Containing 160 acres MOL. Surface rights only. The tract has mostly good barbed wire fences. The tract has a good well of water and a stock pond. Also access to electricity. The NW/4 of 13-11-14, W.I.M., Washita County, OK., (less & except approx. 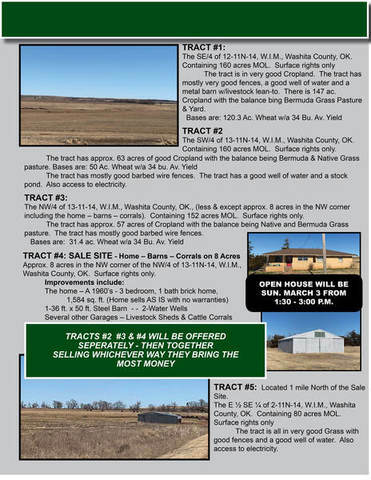 8 acres in the NW corner including the home – barns – corrals). 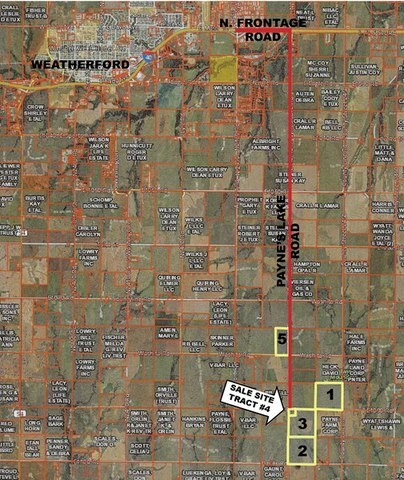 Containing 152 acres MOL. Surface rights only. The tract has approx. 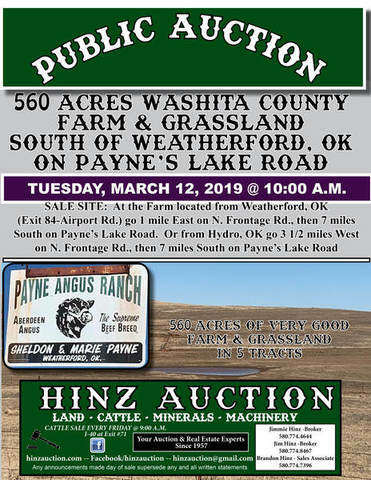 57 acres of Cropland with the balance being Native and Bermuda Grass pasture. The tract has mostly good barbed wire fences. Approx. 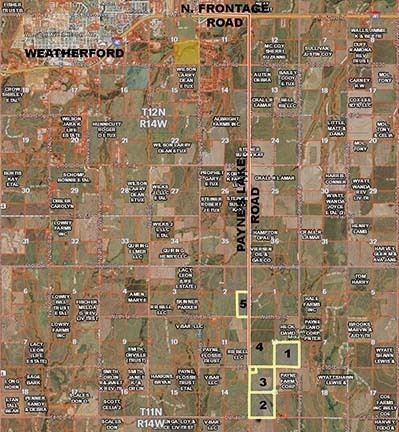 8 acres in the NW corner of the NW/4 of 13-11N-14, W.I.M., Washita County, OK. Surface rights only. 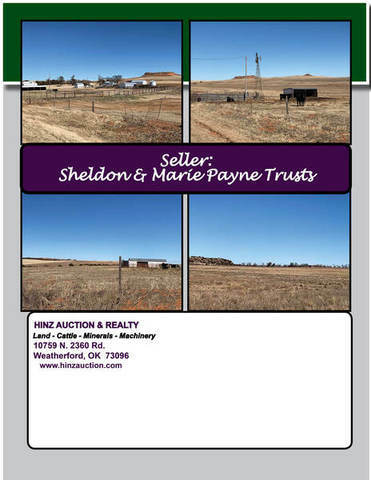 TRACT #5: Located 1 mile North of the Sale Site. The tract is all in very good Grass with good fences and a good well of water. Also access to electricity. needs to come look at this property. The Farms are presently leased to Duane Payne through June 2017. The home is currently under lease. TERMS: 10% of the purchase price due day of sale to be placed in escrow, balance due at closing. Possession will be given July 2, 2019, provided the sale has been closed, subject to all leases. TERMS: 10% of the purchase price due day of sale to be placed in escrow, balance due at closing. Possession will be given July 2, 2019, provided the sale has been closed.